Nightlife of Dubai keeps on buzzing among the party-lovers; no matter in what corner of the world they live. Dubai is one of the finest partying destinations to extract the maximum fun from its amazing venues. If you are a party-sugar, then Dubai has the finest treat of amazing nightclubs, lounges, bars, pubs and restaurants to gratify you. Most of all, Dubai has an amazing and versatile range of bars and pubs that are all set to offer great fun to you and your friends. 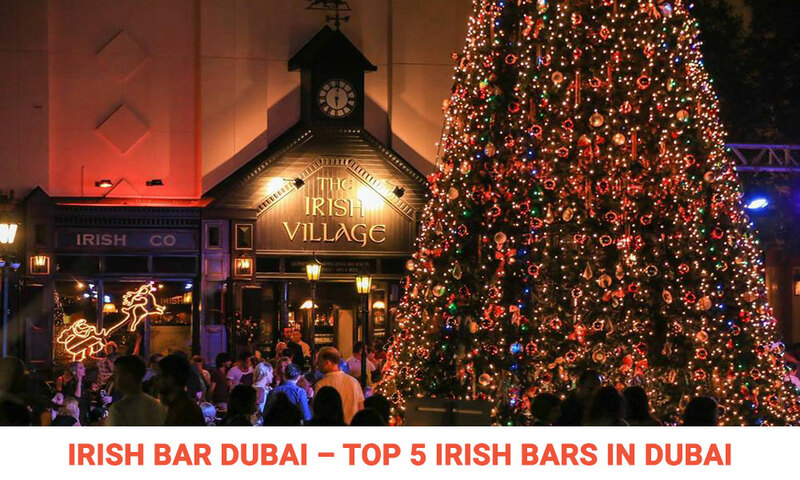 Talking about the preeminent bars in Dubai, Irish bars are always on the top of the bar listing. Dubai has numerous classy and refined Irish bars that can be hardly surpassed by any other destination. Extensive range of Irish bar Dubai is great for late night fun and partying. What makes Irish bars always happening are their lip-smacking range of international cuisines, snacks and excellent range of cocktails and alcoholic beverages. Here we have listed the top five Irish bars that offers the maximum night fun in Dubai, great party scene, delectable food and startling range of electrifying drinks. McGettigan’s is one the most exquisite venues in Dubai that is perfectly designed for enjoying a modern Irish experience. This amazing Irish Bar Dubai delights you with its modern décor, remarkable beer garden, marvelous bar and a perfect cook-house eatery. The place also offers ample outdoor seating for those who love to enjoy their chilled beer and meal in the fresh oceanic air of Dubai. McGettigan’s is absolutely heated and occupied, especially on breezy evenings as their beer garden also brag gigantic digital plasma screens for displaying latest sports events. Their high-tech surround sound systems enhance the liveliness of the ambiance in contemporary settings. The bar is incomparable for relaxing, socializing, catching up after work and ladies night out. McGettigan’s offers an extensive range of meals and beverages and also allow you to enjoy Shisha and Hookah in Dubai in their purposely built smoking zone. It is situated in Bonnington Hotel, Jumeirah Lakes Towers and at Dubai World Trade Centre. The Dubliner’s is a lively Irish bar Dubai with contemporary yet traditional Irish theme, décor and delectable food. Dubliner’s goes perfectly along with the nightlife of Dubai and the place, especially gears up on weekends. Although they have a selected menu, yet any entree that you choose will certainly not disappoint you. The place offers amazing Friday brunch value deal, which include 2 drinks, any meal from the menu and cold buffet for only AED 75. It has a great collection of alcoholic and non-alcoholic beverages and cocktails and also facilitate you to enjoy the attractive exterior view under a big clear dome, which gives a feeling that you are desking in the open air. Dubliner’s has excellent customer service and friendly environment. The place also shows live sporting events. Dubliner’s is located at the Le Méridien Dubai Hotel & Conference Centre, near Sukhothai. Themed like an emblematic Irish street, the Irish Village is a lovely place with both outdoor and indoor seating. This bar offers an amazing variety of food and beverages, and most of all it has wonderful ambiance, lively crowd, live music and cute little ducks roaming around. Their menu is exclusive and their servings are generous with lip-smacking taste and excellent customer service. The place is super crowded, particularly on the weekend and thus prior reservation is prescribed to ensure unobstructed fun. The Irish Village is located at 1 A Street, Al Garhoud, next to the Dubai Tennis Stadium. This Dubai bar is highly recommended for a night out with your friends and loved ones, post-job catches up, ladies night or nay other occasion that you want to celebrate to the fullest. Exquisite venue, relaxing yet lively ambiance, great food, buoyant crowd and electrifying beverages. You can find this all right under the roof of Fibber Magee’s. Fibber Magee’s is an exclusive Irish bar in Dubai, that is quite famous for its contemporary Irish setting, amazing live cookhouse, extensive range of international cuisines and much more. The bar has a giant size plasma screens that are used for displaying current sports event live. Fibber Magee’s is just a perfect place for late night partying and fun with your friend and mates. Fibber Magee’s is situated in Saeed Tower One. Dublin Arms is the next on our list of the best Irish bars in Dubai. With traditional Irish interior and theme, this place is distinctive. Dublin Arms offers a great range of beverages and Irish cuisines. The place is cozy with bright color settings. Dublin Arm’s staff is super friendly and serves you with great hospitality. The place also has some indoor games like snooker and darts. There are also installed indoor screens for showing live sports events. Dublin Arms is a perfect bar to spend an evening or a night out in a typical themed Irish ambiance. Dublin Arms is placed at the Lobby Level, Metropolitan of Hotel Deira, near Clock tower Roundabout, Al Rigga – Dubai. These are some of the best and famous Irish bars in Dubai. If you have experienced one of the above mentioned Irish Bar Dubai or want to recommend one, please do so by adding comments below.